Lightbulbs In The Winter Coop? We all want a year round supply of eggs from our hens. But, despite the unchanging and abundant display at the supermarket, the backyard chicken keeper soon learns that eggs are seasonal. Chickens start and stop laying for many, many reasons. One of them is the amount of daylight. The optimum amount of light to stimulate laying is 14 hours. Today, here in New England, we’re getting just under ten hours daily, and that will dip further to under 9 at the winter solstice in December. (This nifty site calculates the amount of daylight in your latitude.) Factory egg production facilities get around this natural fluctuation by housing chickens in windowless buildings illuminated with artificial lights. LIghtbulbs works for them, but it’s not always the right choice for backyard chickens. I don’t light my coops, and I’ll explain why. Right about now, in late fall, there are a lot of people new to chicken keeping who are anxiously waiting for their young chickens (called pullets) to start laying. They got chicks in the summer and haven’t found an egg yet. Depending on the breed, you won’t see the first egg until 22 to 26 weeks of age, which is usually October or into November. But, that’s when reduced daylight is signaling the pullet to slow down. So, to egg on their pullets (pun intended, sorry!) some chicken keepers keep a light on in their coops. That’s not necessarily a good idea. The University of Maine (where they know firsthand about dark and cold) says that encouraging early maturity with lighting can cause prolapse. Also, A second negative effect associated with early sexual maturity is small egg size. Birds that lay early may never reach their genetic potential in terms of egg weight. And finally, if pullets are stimulated to lay before 17 or 18 weeks, their lifetime egg output may suffer. So, wait to hang a light until after your chickens are consistently laying normal eggs. In my experience, pullets lay through the winter without additional light. But, one reason that I have had that success is because I designed my chicken housing to have plenty of windows. The Gem’s first winter was a snowy one, and I couldn’t even shovel out their pop-door to let them outside. If they’d been stuck in a small dark coop, they would not have laid an egg. But light streamed in the windows. They had sunny patches to loll in. They laid eggs all winter. By their second winter, most hens are about 18 months old and so they are all at some stage of the molt. The molt takes up to 8 weeks to complete. During that time they stop laying. It doesn’t speed things up to add a light, and it won’t bring on more eggs. Later in the winter you can stimulate more egg production with a light, but you still won’t get as many eggs as you do in the summer. That might not be a bad thing. Back in 1923, A University of Illinois Agriculture College bulletin warned: Care should be taken not to overstimulate the hens by the use of artificial lights. A production of more than forty eggs daily from each hundred hens during the winter months may be disastrous in that it may result in a spring molt. 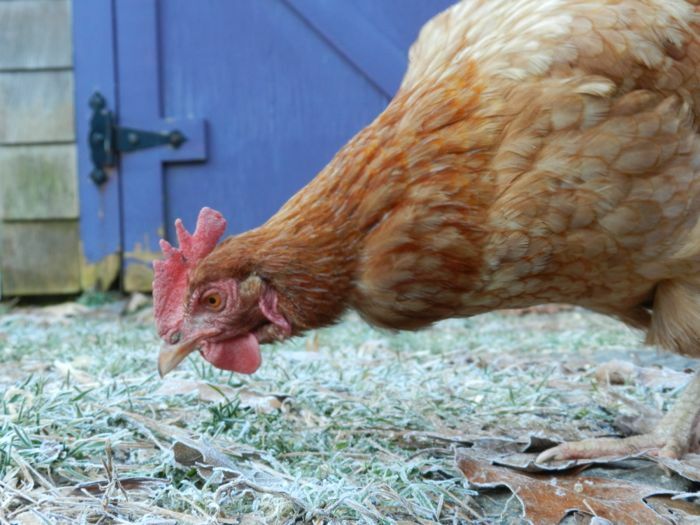 Molting is a sign of stress, and it makes sense that forcing egg production during the winter, which is a time of rest and rejuvenation for chickens, would cause issues. Over the years I’ve tried hanging a lightbulb in the coop to increase winter egg production. I’m sure it’s worth it on a large scale – if you have 100 hens, it will make a difference to your bottom line and pay for the electricity. It also works if you have hens under two years of age; in a backyard flock of six birds you might go from collecting one egg per day to three. But, if you have older hens like I do, the added light won’t make a difference. They’re going to take a break no matter what. 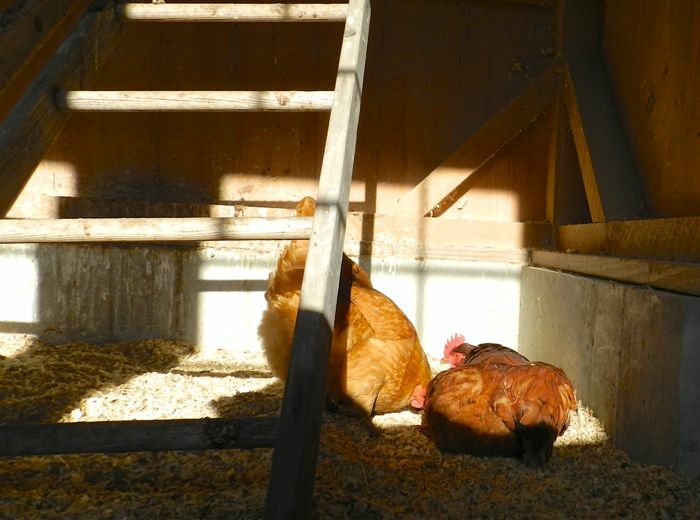 If you do decide to use light in winter, (definitely an option if your coop doesn’t have windows) then there’s a few things to know. A 40 or 60 watt bulb is plenty. Worry about fire. Periodically inspect the wires for gnawing by mice, and dust off the bulb. Do not leave it on all night, as it’s been shown that constant light is detrimental (the girls need their rest!) Put it on a timer and have it turn on in the early morning hours. Don’t have it turn on after dusk and then turn off to suddenly plunge the chickens into darkness in the middle of the night – chickens do not have any night vision and they’ll be stuck on the floor of the coop, unable to make it up onto their roosts. and, actually, they rather like how all of that frosty ground sparkles. So, give them as much natural sunshine as you can. Use your judgement about adding a lightbulb if your housing keeps them in the dark for long stretches. And don’t expect an egg everyday. Thanks for this entry. I belong to the meetup.com group: los angeles urban chicken enthusiasts (LAUCE) and this topic has appeared on the discussion board. I suggested that members make their way to Hencam for the great tips and the webcams, of course! Thanks for letting people know about my website. Much appreciated. I can’t imagine that you’d need to leave a bulb on for SoCal chickens! Not only that, but people here talk about heating their coops! Oy! It got down to 40 degrees last night…i think the chickens are loving it. It’s going to be 80 during the day…a normal socal fall. BTW – I am still getting an egg per day from each of my 8 hens. Oy is right! How old are your hens? My hens are barely 9 months old. Just started laying in July. Prime laying time! My Gems laid all through their first winter. A question if you can respond…Is that a butternut squash in their yard? Do you have to start an opening in it for them? They seem so hard for a chicken to peck. Yes, butternut. I was cleaning up the squash patch and found two that are more suited for the hens than me. The Gems have no problems pecking through hard squash shells. The old girls need a little help – but Candy likes to gnaw on it. Thank you. I never would have thought to give them a butternut. Those beaks must have some kind of built-in shock absorption for the pecking they do. Love the post;) I have added a light in the morning and it seems to be fine. Egg production is back on track. I only have it on for 2 hrs. I have already had the problem of the timer freezing so we are currently adjusting our plans on this. Got to love Utah weather! We’re thinking of building a box to cover the outlet area so lets hope that works! I also was glad to see you say that 40 or 60 watt bulb works! I hope people realize that if they get use to the heat of a larger bulb then they suffer if the power goes off!!! Good point, Marissa, about the temp change without the light. BTW, in a small coop, the heater under the waterer gives off just enough heat to help keep the coop dry and to warm things up a tad. Here in southern Ohio we currently have about 10 hours of daylight. By mid December we will be down to about 9 hours. I have supplemented my girls since mid September with extra light. My coup is 4×6 with 5 small windows. The girls are out from 8 am till 5 pm in a totally enclosed run. Because of the size of the coup I am using only a 15 watt bulb. I plan to have them get about 13 hrs. Of light per day. It seems adequate as the eggs are getting larger and for the six girls we are averaging 4 to 5 per day. The girls are about 10 months old. Love your column and of course the webcams. Just let the girls out for the day. The overnight temp was 25 degrees. With the water heater and the small bulb the inside temp was 35. As soon as I opened the coop to the run, the girls bounded out. My girls are jealous of your cold weather. It’s raining here. Rain they stay inside for, but cold doesn’t bother them a whit. I think that your small bulb is probably doing a good job of keeping the air in your coop a tad dryer. Great! what about red heat lamps to keep them warm? I advise against heat lamps for most situations (bearing in mind that I don’t live in North Dakota!) I don’t think that the red light has an effect on laying. Someone want to chime in here? The 1923 bulletin was correct for 1923. But in 1950, there was The Year of the Chicken, which corresponded to the industrialization of all foods. The idea was to take all breeds and see which ones could be changed to lay more eggs, or grow more meat. Some breeds were changed drastically (how the Cornish Cross came about) and others washed out more quickly. But virtually every breed was affected. Hens in 1923 laid 50 eggs a year or less. They were much smaller framed. They could survive with minimal inputs from owners. But the chickens of today are capable of laying 250+ eggs a year, have much larger frames, and generally have been bred to do only do well on commercial feeds. 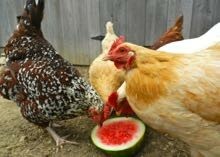 If they are fed properly, laying year round for the first 2 years does not tax them. Once a hen is older, the laying rate drops quickly. Molting does affect laying because feathers are over 70% protein, and so’s an egg. They can only direct resources to one of these. Molts can last up to 8 weeks or longer, but feeding supplemental animal protein at 1/2 oz/bird/day can decrease the length of molt to 3-4 weeks. I’ve done this, particularly at this time of year. With the cost of organic feed risen half again what it was in 2010 (currently $25.94/50#), if one sells eggs, it does help offset the high cost of keeping hens. As hens use more feed in winter to keep warm, making sure they are well fed, and waterered, so they can lay well makes economic sense. But one can not expect a hen over age 3 to lay well, as they are no longer capable. So letting them just have natural light makes sense if they are pets. Hi Pam, I so appreciate your perspective as a small farmer. I do say in my post that light can help the bottom line in commercial operations for – as you point out – young birds. BTW, by the 1920s most real farmers had switched to higher producing hens, like leghorns. Ag schools were doing “laying hen tests” and touting hens that laid 250 to 300 eggs per year. Soy was yet to be used widely in feed. Farmers did use extra protein – you could buy bags of meat, rather like dog kibble. Farmers also had “green bone cutters” in their poultry yards to feed the waste from slaughtering of their other animals. They didn’t yet have the cornish cross for meat birds, but that’s another story, and I only do laying hens, so won’t get into that history! I dont think I will d a light. They need the rest. I am concerned about fire hazaard with the water heaters. The rainy season is just starting in Northern Calif. so I just finished staining our coop and installing another window in the access door. We are getting just under 10 hours of sunlight so I’d like to put in another window so that our 3 ladies can loll around in the sun inside where it is dry. They are almost 8 months old and the 2 Barred Rocks are both still giving us about 1 egg a day. Our Easter Egger has slowed down a bit and is giving us a pretty blue egg every 2-3 days. I won’t light their coop…okay, maybe some Christmas lights. Thanks for all the great info on the site we’ll be sharing with our customers and readers.